Today I have a treat for you - Megan of Homemade Ginger is here to show us how to make curtains out of sheets. Megan's blog is full of cute projects and posts. Recently she posted about using her homemade yogurt to make cream cheese. Homemade yogurt is something I've been wanting to try! I think you will also enjoy her family room transformation. Wow - the power of a can of paint! You won't believe the before & after. I'm also guest posting at Megan's blog today and sharing my quilted coasters project. Thanks for blog swapping Megan! Hello everyone! I'm so excited and honored to be sharing with you all today! I blog over at Homemade Ginger and love coming up with easy and frugal DIY projects. 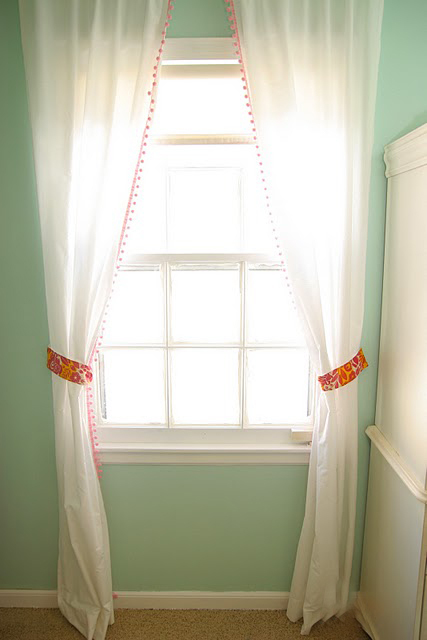 Last year, when I was re-decorating my 3 year old's room, I made some super easy and super cheap curtains. Everyone who tells me they can't sew things like curtains needs to make these, there is barely any sewing required! They probably cost under $10 total, which is also a big plus! First, you need to cut the sheet in half length-wise. I chose to rip it. Yes, ripping fabric is actually a great way if you have a large piece. It also guarantees to be perfectly straight because it tears right along the weave of the fabric. Just fold it in half, cut through any seams and then rip away! Then, you need to fold over the ripped edge (about 1/4 inch) and iron. Fold again 1/4 inch and iron. Sew along the folded edge. Now, you need to make the top part of the curtain casing for the curtain rod. I did the bottom of the sheet (the smaller already sewn seam) and just folded it over about 2 inches and ironed. Now, just sew along, close to the open edge to create a casing for the curtain rod. Of course you will do all of these steps to both curtain pieces. Now, pin on the ball fringe on the outside of the curtain edges and sew down. Thanks so much for having me Alissa. Come stop by Homemade Ginger and say hi sometime, everyone! 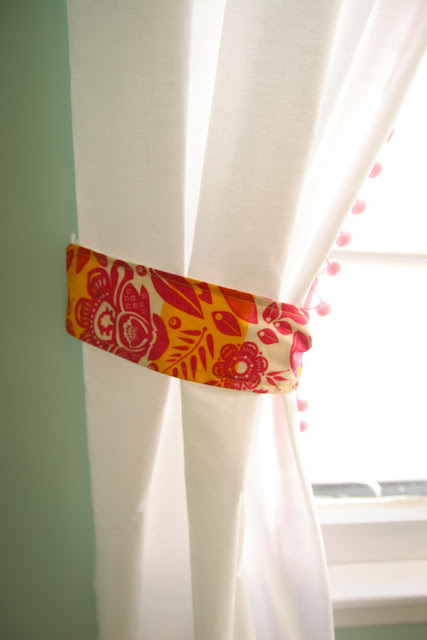 Thanks Megan for sharing your curtain tutorial with us! If you've never visited Megan before, head on over for a visit. I think you will really enjoy her blog. 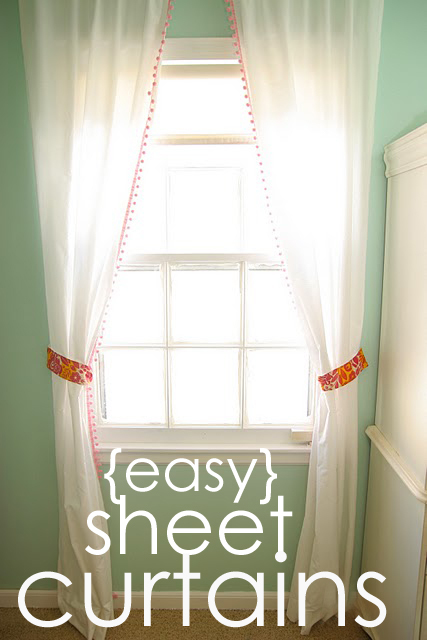 wow...it's so easy...and the results are cute, dainty curtains!! great idea! I'm definitely going to try this! I have a nursery that is going to require some cute curtains soon. such a great DIY :) love that little fringe.